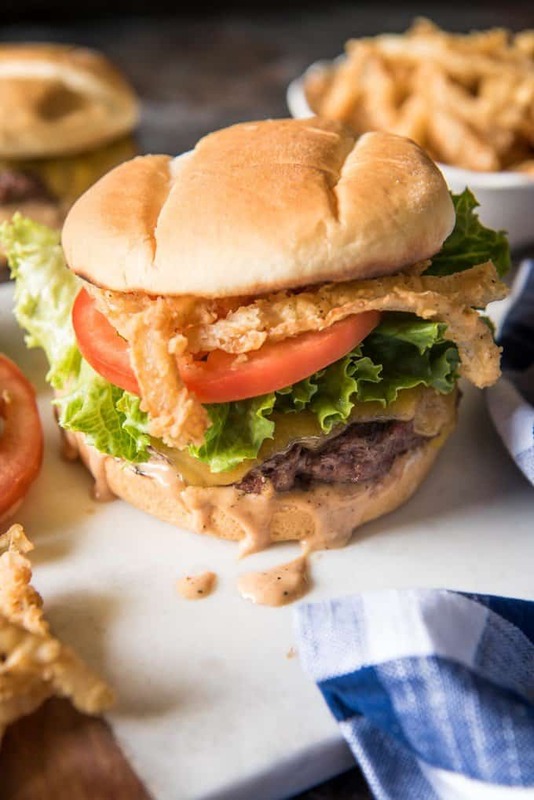 This All-American Hamburger with Crispy Onion Strings & Burger Sauce is incredibly juicy, loaded with delicious flavors, and is just the thing to kick off the summer grilling season! 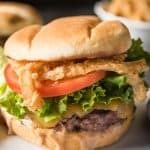 Let’s talk burgers today!! 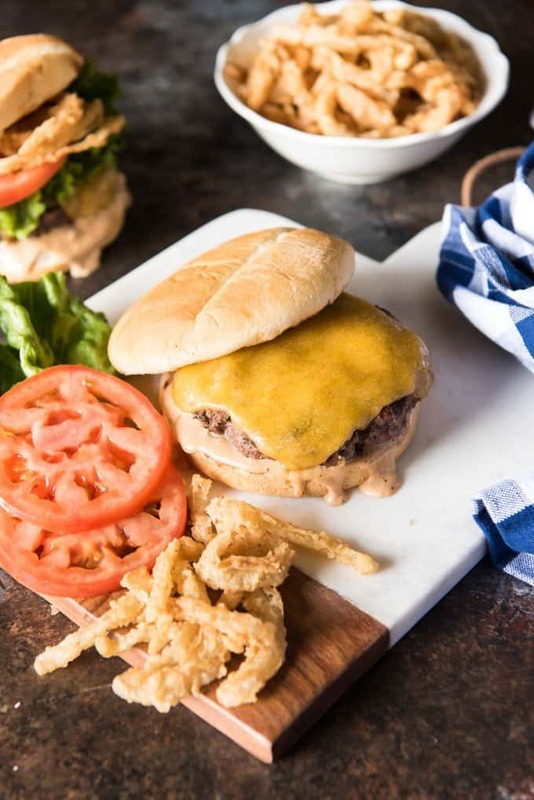 With Memorial Day weekend, Father’s Day, and the Fourth of July coming up and lots of outdoor summertime grilling on its way, I figured it would be a good idea to kick things off with a good old-fashioned, All-American Hamburger with Crispy Onion Strings & Burger sauce. I love grilling and since we live in California we do it almost year-round. We love to grill up whole fish like Arctic Char or Branzini for special occasions or pull out the go-to boneless, skinless chicken breasts and do grilled Cajun chicken for grilled Cajun chicken sandwiches or grilled Cajun chicken salads. But sometimes only a juicy, towering cheeseburger will do. I’ll admit that these fried onion strings are a special treat that I will make every now and then when I really want to make regular hamburgers into something extra special. They take a little extra work and they definitely aren’t part of a healthy eating plan since they are deep fried, something I don’t do often. But boy-oh-boy are they amazing. Definitely worth the extra effort. Just watch out because since the crispy onion strings are fried in batches so as not to crowd the pan, it’s super hard to not snack on the ones from the first batch while frying the remaining batches. The burger sauce is super easy and really amps up the flavor of the burgers. It’s also perfect for dipping fries, tots, or extra fried onion strings. Other than that, I don’t get too crazy with my burgers! You could add bacon and BBQ sauce (Paul always does) or some sliced avocado (my other go-to addition) if you are wanting to make these even more outrageously delicious. 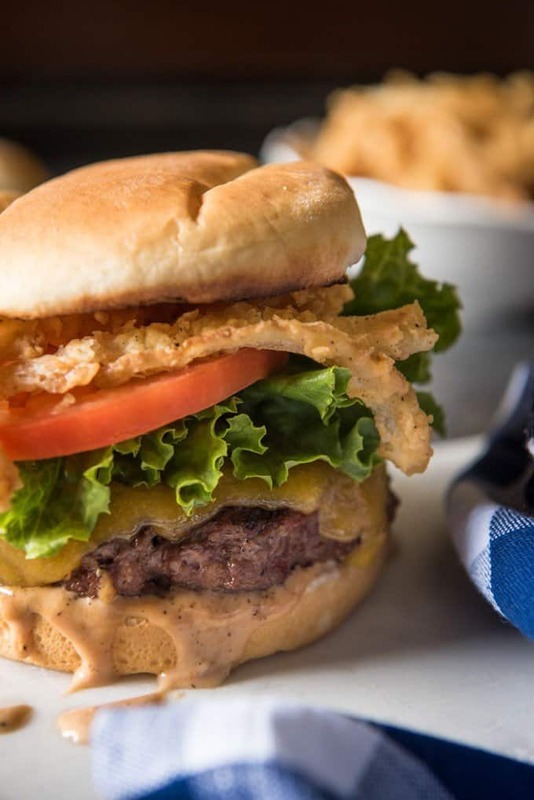 But I think these All-American Hamburgers with Crispy Onion Strings & Burger Sauce are pretty much perfect just the way they are. Always form your patties a little bit larger than the size of the bun you plan to serve them on since they will shrink slightly as they cook. Also, press your thumb into the center of each patty to create an indentation before putting them on the grill. It will help the burgers cook more evenly and not puff up in the middle while cooking. Use high heat and only flip the burgers once. Hamburgers shouldn’t be overhandled or they won’t be as juicy as they should be. Flipping them too frequently won’t let the meat juices disperse as well, and definitely do NOT flatten the burgers with your spatula while they are grilling! That just squeezes out all of the juices (aka, deliciousness) and you will end up with dry, sad burgers. Don’t skimp on the buns. Quality buns make a big difference in your burger experience. You can always make your own, or just pick up some good brioche or french buns from the store. And I 100% recommend toasting those buns on the grill during the last few minutes of cooking the burgers. If you are gonna want some fries to go with your burger, check out my Baked Greek Feta Fries or my Oven Roasted Barbecue Potato Wedges. And there is nothing more perfect with a big, juicy burger like this than a glass of ice cold homemade lemonade! Unless maybe it’s a root beer? What say you? And has anyone made homemade root beer before? Because it’s on my summer bucket list for this year and I’m looking for pointers! Heat 2 inches of oil in a large pot over medium-high heat until the oil reaches 350 degrees. It helps to have a thermometer that clips to the side of the pot to make sure the oil temperature stays constant while frying the onion strings. Whisk the eggs and buttermilk together with a fork in a medium-size bowl. 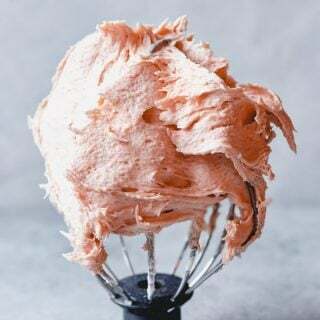 Whisk the flour, salt, pepper, and garlic powder together in a separate bowl. Working with about 1/4 of the onion slices at a time, dredge them first in the egg/buttermilk mixture, then let the excess drip off and dredge them in the seasoned flour mixture, tossing lightly to coat. Shake off any excess flour before carefully dropping the onion slices into the hot oil, being careful not to crowd the pan. Fry until golden brown, then remove from the oil using a slotted spoon and transfer to a paper-towel lined plate. Repeat until all of the onion strings have been battered and fried. Combine all of the burger sauce ingredients together and adjust seasoning to taste. Refrigerate until ready to serve, up to 1 week. Get your grill going on high heat. Make sure the grates are clean. Divide the ground beef into 4-6 individual portions and shape into patties that are slightly larger than the size of your buns and no more than 1/2-inch thick. They will shrink a bit as they cook on the grill. Make an indentation in the center of each patty to help them cook more evenly. Generously season each hamburger patty on both sides with seasoned salt and black pepper. Transfer the hamburger patties to the hot grill over direct heat and cook for 5 to 8 minutes on each side, flipping only once. I tend to prefer my burgers on the medium side with just a bit of pink still showing, so 5-6 minutes is perfect. If you prefer your burger more well done, then go 7-8 minutes on each side. 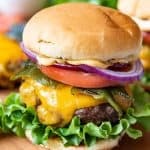 Top each burger with a slice of cheese during the last minute of grilling and close the grill lid to help it melt completely. Toast the buns alongside the hamburgers during the last few minutes of grilling. 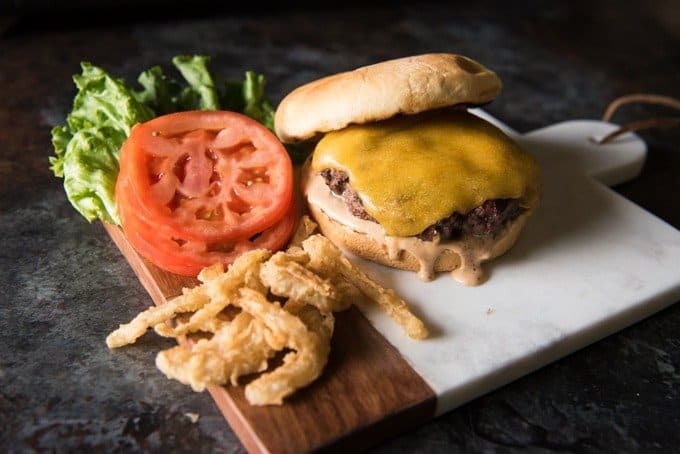 Assemble each burger with burger sauce on the bottom bun beneath the burger patty, melted cheddar cheese, lettuce, tomato slices, crispy onion strings, and additional burger sauce on the top bun, then serve and enjoy! Those onion strings are so sinful and surely add such a new flavour to the burger. 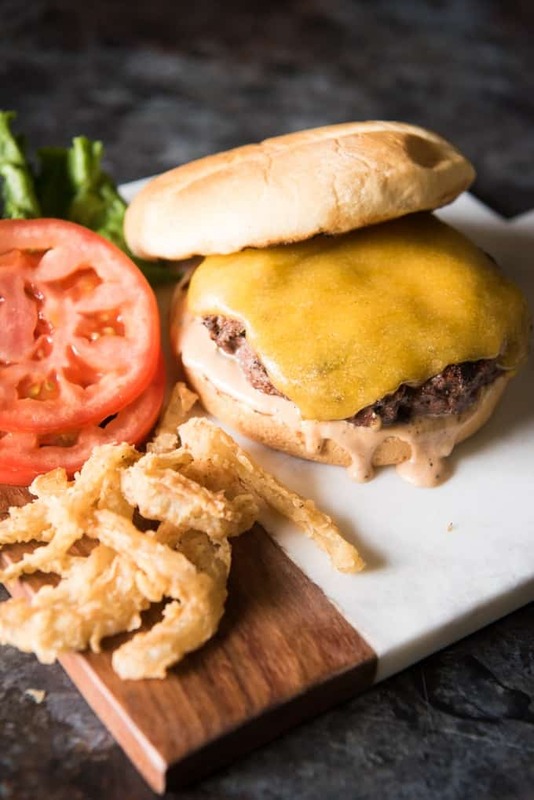 With all that cheese and these onion strings, the burger looks so filling. This is perfect summer..!! I love crispy onion strings. The burger looks so scrumptious..!! Yum. This looks like the perfect burger! It just started heating up here, and I am excited to start grilling again. Love the crispy onion strings too. Just in time for the long holiday weekend! This looks awesome. So glad grilling season is here. Love those onion strings. Can’t wait to fire up the grill and give this recipe a try. I can see myself having a nice bite from that burger. That sauce is just amazing, l find some burgers a bit dry sometimes, so the sauce must go very nicely with it. No one can possibly say no to such delish! Oh man do these look good! Great tips for getting a delicious burger. I love to use pretzel buns for an added jazz! These are so perfect for summer and cooking out! 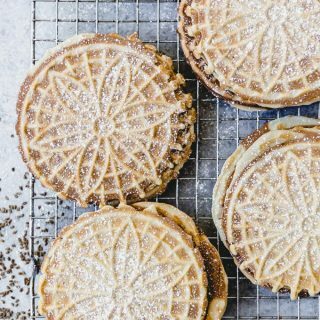 Could definitely go for some of these right now 😉 My husband would love them, too! Burger season is here! 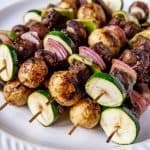 This recipes is so perfect for those weekend cookouts! Who doesn’t love crispy onions? They can give me their serving!! You are right these are perfect hamburger. I need to try your crispy onion strings. Love the sauce too. Great recipe. Grilling season is here and what a way to start summer .The burger excellent, very juicy and loved the side of crispy onions !! The hamburger sounds like a great recipe for a fun weekend brunch with family n friends. Those crispy onion strings look so yummm. 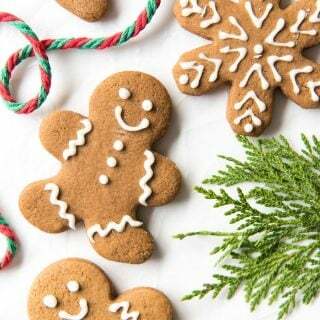 Would try making them soon. You are making me want one of those hamburgers and it’s only 6 AM. It is Memorial Day so maybe this will be on the table. Love the sauce! We all love a good burger here at our house. Your crispy onion strings sound great, they wouldn’t last long around here! I adore onion strings on a burger, just makes it so yummy! 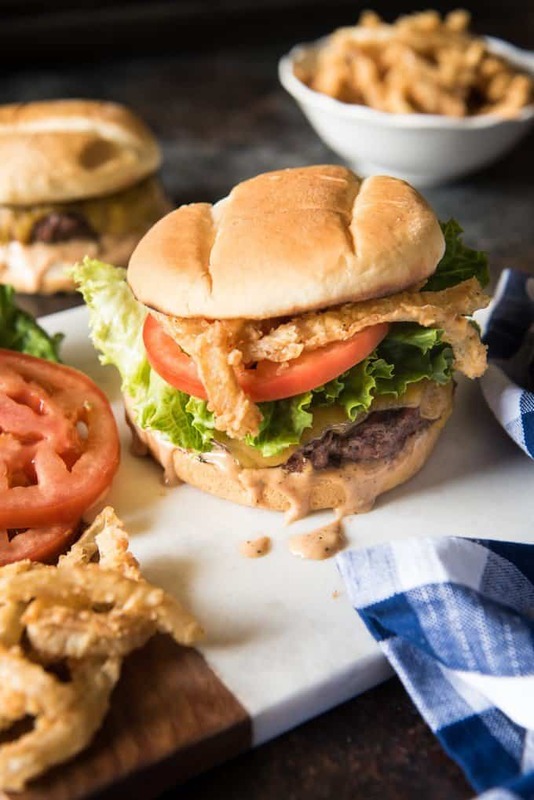 The burger sauce sounds super delish as well, and I can’t wait to make this! Those onions strings look to die for served on that burger! Seriously, that’s a way to eat a burger. And now I’m also craving Baked Greek Feta Fries, that would be so GOOD. I can’t even with how amazing this looks! This is definitely my type of burger with those crispy onions! Well done! Wow! This looks like the perfect burger. I love the addition of crispy onions on top!! Homemade burgers are definitely the best! Yours looks scrumptious. Love the onion strings and burger sauce too. Definitely want to give them both a try once our grilling season starts! I love over the top hamburgers! The sauce and onion rings! WOW!! You deserve to be hailed by the burger gods for his lovely recipe… Not only because it sounds superb but because you have produced a burger that it looks like it is possible to eat! Thanks, Brian! Seriously, I don’t even understand why create a burger like that!